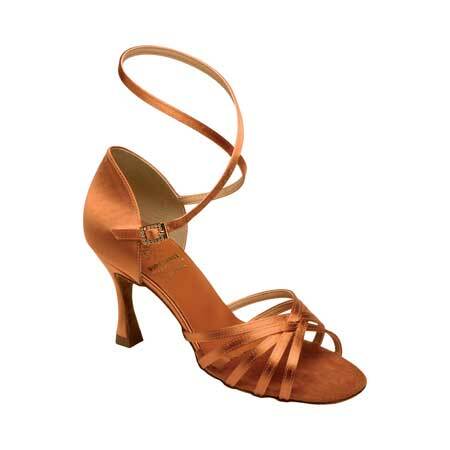 The 1403 is a latin sandal with a 5 strap vamp, two way fastening strap (under the arch or around the ankle) with diamante buckle and quick release hook. It has a slimmer arch to aid in pointing/flexing the foot, snugger fit for better control and tapered front to more closely follow the toe line and minimize the amount of sole exposed. More information is available below. NOTE: English to American Sizing is approximate. The information is shown as a guide only and not a guarantee. Actual fitting may vary. 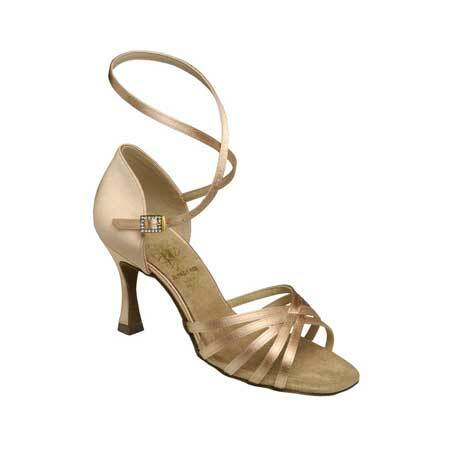 American 4 through 11.5 in Medium width in Flesh Satin or Dark Tan Satin with a 2.5″ or 3″ Flare Heel. 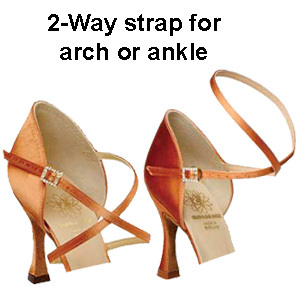 Narrow and wide widths are available in sizes 4.5 thru 10.5 in Dark Tan Satin with a 2.5″ Flare Heel.